Sunday Morning, August 19, 1917. AMONG the thousands of suggested methods of fighting submarines--most of them by persons who have not even rudimentary knowledge of the conditions with which they are attempting to deal--a few stick out with every appearance of being practical. The August number of the Electrical Experimenter features three of these: one by its editor, one by Nikola Tesla, and one by H. Hartman, a New York electrical engineer, inventor of the submarine camera and other devices. All have the merit of novelty. Mr. Tesla's invention is a way of detecting submarines before they can be seen. 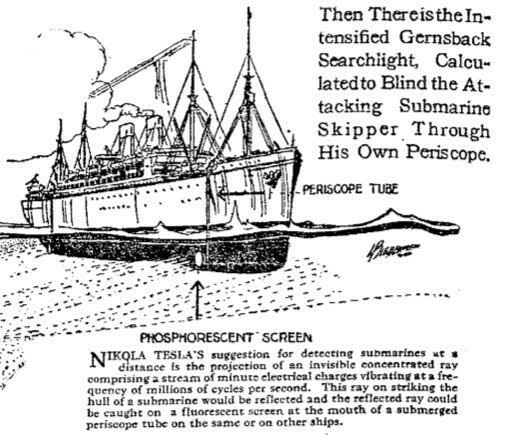 That of Mr. H. Gernsback, editor of the Electrical Experimenter, is a method of blinding the submarine so that its commander cannot take aim with his torpedoes. That of Mr. Hartman is a small submerged fort, containing torpedo tubes, for protecting the entrances to harbors from attacks by submarines. "If we can shoot out a concentrated ray comprising a stream of minute electric charges vibrating electrically at tremendous frequency, say millions of cycles per second, and then intercept this ray, after it has been reflected by a submarine hull, for example, and cause this intercepted ray to illuminate a fluorescent screen (similar to the X-ray method) on the same or another ship, then our problem of locating the hidden submarine will have been solved. 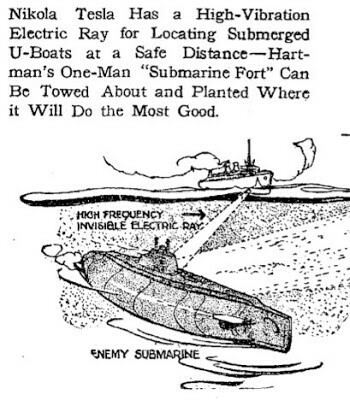 Nikola Tesla Has a High-Vibration Electric Ray for Locating Submerged U-Boats at a Safe Distance--Hartman's One-Man "Submarine Fort" Can Be Towed About and Planted Where it Will Do the Most Good. 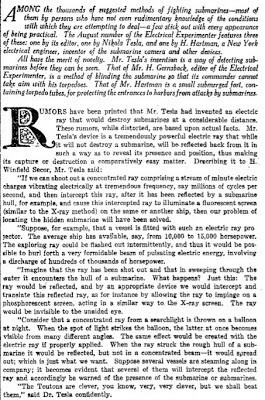 NIKOLA TESLA'S suggestion for detecting submarines at a distance is the projection of an invisible concentrated ray comprising a stream of minute electrical charges vibrating at a frequency of millions of cycles per second. This ray on striking the hull of a submarine would be reflected and the reflected ray could be caught on a fluorescent screen at the mouth of a submerged periscope tube on the same or on other ships.